The following appeared on National Steeplechase Association’s website and was written by Don Clippinger. 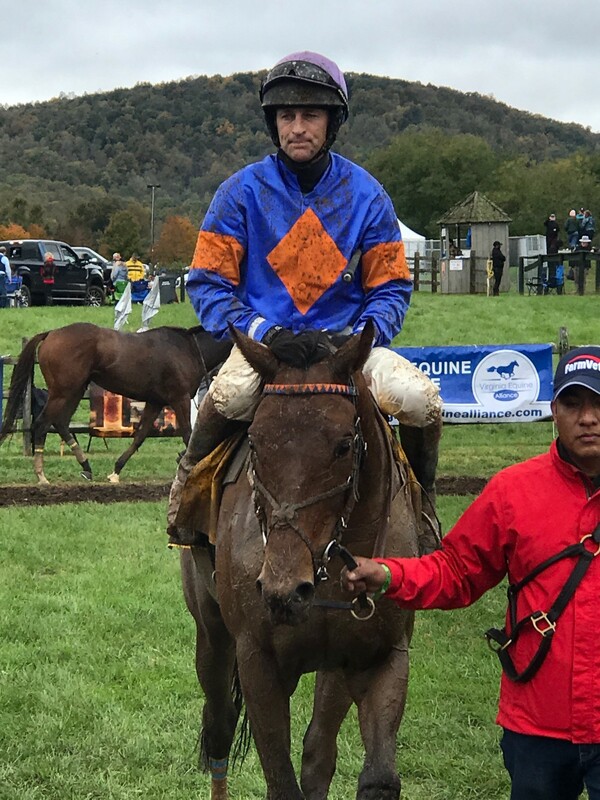 Doc Cebu and jockey Hadden Frost played cat and mouse with Le Chevalier for the first three miles of Saturday’s International Gold Cup before decisively ending the game and drawing away to a 5 1/4-length victory in the National Steeplechase Association’s richest fall timber race. The victory, worth $45,000 to last year’s timber champion, propelled the eight-year-old Hard Spun gelding into the lead for this year’s timber title with only one weekend of timber racing remaining on the 2018 schedule. 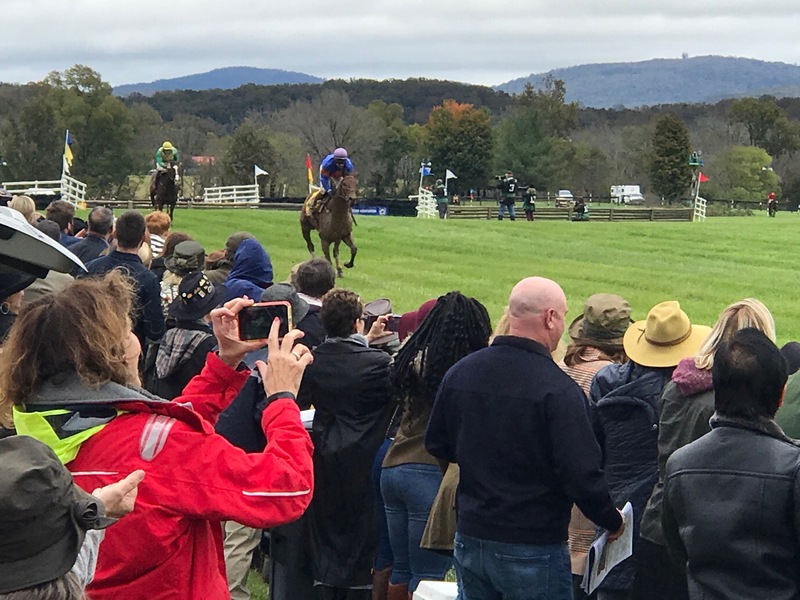 Now owned by Charles Fenwick Jr., Michael Hankin, and Charles Noell, Doc Cebu had secured last year’s title with a victory in the International Gold Cup at Virginia’s Great Meadow Race Course. Trained by Jack Fisher, he won that edition by 11 lengths, and on a cloudy, cool afternoon he proved that soft ground was no impediment as he defended last year’s victory. Doc Cebu captured his second straight International Gold Cup on October 27th. Photo by Tod Marks. Irv Naylor’s Super Saturday, third for much of the 3 1/2-mile race, overtook Le Chevalier in Great Meadow’s stretch and took second money, 4 1/2 lengths clear of Le Chevalier. Favored at 6-5, Doc Cebu paid $4.40 to win after running the distance in 7:30.90. Frost broke Doc Cebu sharply and put him on the lead, with Michael A. Smith’s Le Chevalier right behind him. After a quarter-mile, leading jockey Jack Doyle sensed Frost was choking down the pace and moved Le Chevalier to the lead, while Frost kept Doc Cebu on the inside and took the shortest route around Great Meadow. They held that position for more than two miles until Le Chevalier began to weaken approaching the last two fences, and Darren Nagle went to the whip to urge Super Saturday forward. Approaching the last fence, Doc Cebu took command, drew clear, and carefully jumped the last fence. Frost brought him home under a hand ride, while Super Saturday gradually overtook and passed Le Chevalier for the place. The win raised Doc Cebu’s 2018 earnings to $102,000 and moved him ahead of Maryland Hunt Cup and Grand National winner Senior Senator, who has $90,000 in the bank. Fenwick, who acquired Doc Cebu off the flat in a two-horse deal for $12,000, said he had expected a tussle from Le Chevalier, winner of Virginia Fall’s National Sporting Library & Museum Cup for trainer Julie Gomena on Oct. 13, the same day Doc Cebu won the Genesee Valley Hunt Cup for the second straight year. “It was a classic timber race,” said Fenwick, the sport’s leading timber jockey in the 1970s and 1980s. Rosbrian Farm’s Optimus Prime, a Grade 1 winner in his first U.S. start, overwhelmed his opponents in Saturday’s $75,000 David L. “Zeke” Ferguson Memorial (Gr. 2), the International Gold Cup’s featured hurdle stakes. 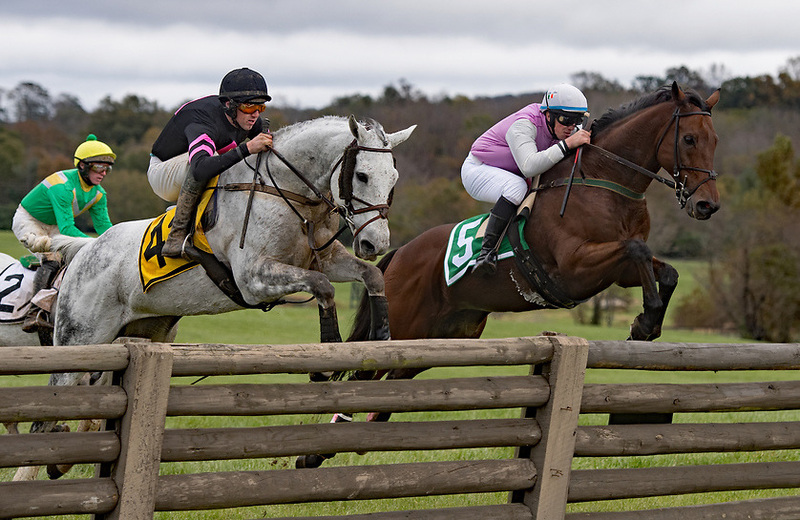 Optimus Prime opens up in deep stretch in Saturday’s “Zeke” Ferguson Steeplechase Stakes. Jockey Ross Geraghty had Optimus Prime in prime position and just off the early pace set by Personal Start and then Sempre Medici before bursting away from them over the final fences and drawing away to an 18-length victory as the even-money favorite. The win, coupled with two victories at the Aiken Fall Steeplechase, moved Ricky Hendriks to a two-race advantage over Fisher in the trainer standings. He admitted that he had some concern over the soft ground and consulted with jockey Noel Fehily, who had recommended the purchase of the French-bred six-year-old. “He told me not to worry. This horse handled every kind of ground in Ireland,” Hendriks said. After his purchase in May, Hendriks and assistant trainer Eve Ledyard had Optimus Prime on a fast track to get him ready for Saratoga’s New York Turf Writers Cup (Gr. 1) on Aug. 23. Their work paid off when Geraghty rode him to a 1 1/4-length victory. He subsequently was third to stablemate Zanjabeel in Belmont Park’s Lonesome Glory Handicap (Gr. 1) on Sept. 20. Ross Geraghty leads Optimus Prime back to the winners circle after winning the “Zeke” Ferguson Memorial. Geraghty rode Optimus Prime with confidence in the Ferguson, keeping him on the inside while first Personal Start and then Sempre Medici set the pace. Geraghty, the leading jockey by purse earnings this year, moved his hands ever so slightly, and Optimus Prime roared away from his competition. Under a mild hand rise, Optimus Prime was well clear before the final fence, jumped the last with care, and steadily drew away. Naylor’s Sempre Medici, ridden by Nagle, easily held second, 16 lengths clear of Edith Dixon’s Schoodic. Optimus Prime raised his U.S. earnings to $167,500 after running the Ferguson’s 2 1/8 miles in 4:13.40. He paid $4 for a $2 win ticket. Nagle had two winners on the International Gold Cup program, with Wits End Stable’s Katnap in the Steeplethon Stakes and with Naylor’s Elucidation in an allowance hurdle, to move within one victory of Doyle, who won the afternoon’s opener, a Sport of Kings maiden hurdle, aboard Merriebelle Stable’s Renown.